HIS DEBUT ALBUM "THE THOUGHT OF YOU"
Drummer Otis Brown III – an invaluable sideman with the likes of Esperanza Spalding, Joe Lovano, Terence Blanchard, Oliver Lake, Somi, and others – has announced the release of his debut album The Thought of You, which will arrive August 26 via Revive/Blue Note, a new partnership between Revive Music and Blue Note Records. Everything on this record is a part of me,” says Brown of the 11-track set which features originals from Brown and his bandmates as well as unexpected covers. The album embodies the essence of what Brown holds most dear: faith and family. 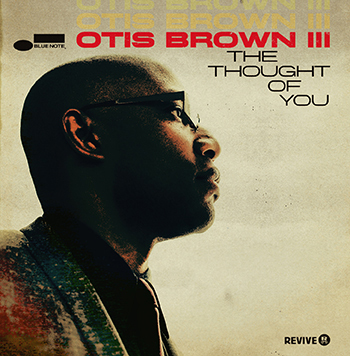 These themes run throughout from a stunning gospel medley featuring Ross to the reinvention of Shania Twain’s “You’re Still The One” – one of two dedications to Brown’s wife – which is given a complete makeover with a new arrangement by Glasper and a moving vocal performance by Parlato. Brown’s “family first” philosophy shines through right out of the gate with the album’s opener “The Way (Truth & Life),” co-written with Glasper. The highly energetic and lyrical piece features the album’s core quintet which, with the exception of Williams, re-assembles their college jazz ensemble from their days at The New School for Jazz and Contemporary Music in New York City. “The most special thing about working with Otis is simply the joy he gets out of playing music; it's all over his face like a little kid,” says Glasper. “People have lost that joy and take playing too seriously.” This point is well illustrated on “The Thought of You”; a jam session-like trilogy weaved throughout the album which opens with a signature vamp from Glasper and Brown providing a knocking backbeat before the group breaks into a glorious swing with Bilal, a vocalist of astonishing versatility offering a rare glimpse at his bona fide jazz chops. After playing saxophone and drums in school and church, and attending Delaware State University as music major, Brown crossed paths with jazz icon Donald Byrd and his course was dramatically altered. Byrd, who was Artist in Residence at DSU, convinced Brown to think beyond a career in music education and go to New York City to be in the thick of things. “It was life changing,” says Brown, who after studying at The New School for Jazz and Contemporary Music and the Thelonious Monk Institute, caught the attention of Joe Lovano. Initially subbing for Lewis Nash and Idris Muhammad in Lovano’s bands, Brown became a founding member of Lovano’s Us Five quintet, recording three albums, including the GRAMMY-nominated Bird Songs.